Just like Israel we are but poor, miserable sinners and so hard of hearing and so callous in our ways, that we first have to land up all stuck in the mud, hopelessly bogged down and unable to move this or that way in the mother of all cul-de-sacs, before it dawns to us, that we’re unable to help ourselves, that we are not as self-sufficient as we thought we were and that we’re not as in control as we’d like to be. Something like Saul on the way to Damascus, Augustine at his wits end, Luther all caught up in the storm of his life. The endless list could be amended at will. Decisive however is that in this desperate situation, where there’s no way out whatsoever. that’s when God shows his unlimited potential and truly divine power to deliver, rescue and grant a new start. Every single conversion is a miracle and wonder of this kind, because none of us can “by our own reason or strength believe in Jesus Christ, our Lord, or even come to Him; but the Holy Spirit has called us by the Gospel, enlightened us with His gifts, sanctified and kept us in the true faith.” (Martin Luther’s Small Catechism 2nd main part “The Creed” 3rd Article). See, our Lord and God does that work of salvation, redemption, delivery and liberation, before we are ready or have got our ducks all in a row. He gave his only begotten Son, while we were still his enemies, lost in our rebellious ways, far off in idolatry and pagan ways – worshipping horses, stars and all sorts of creatures and man-made-effigies. Not even knowing the true God and creator of all, but rather lost in our own small world, which didn’t dwell much on faithful theology and didn’t bother too much about God’s truth and positive revelation either. 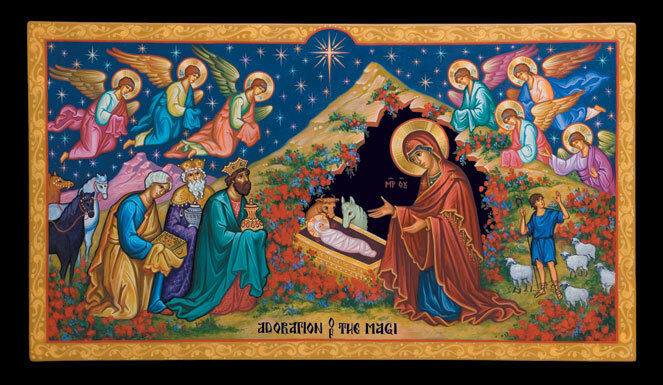 Since Christmas there in Bethlehem, when the kindness and love of God our Saviour appeared to those shepherds in the fields and called those wise men from the East to witness the incarnation of his divine self lying in the manger and at the breast of the blessed virgin – Mary, the true mother of God, he has not ceased to bring to light this divine truth and saving gospel, which was proclaimed since the earliest days right from the beginning after Adam and Eve lost paradise. The living God has let his kindness and love shine over sinful mankind, drawing them always closer and closer to himself, always in the process of delivering us from all evil and leading us to our true destination in his delightful and blessed presence. This our salvation and gracious delivery from all sin and evil is not our accomplishment. Rather it’s only due to his mercy and kindness. It’s not our due and not a result of our endeavours or inputs, but rather his work of regeneration and renewing of the Holy Spirit. This he does through the wonderful and miraculous washing of Holy Baptism. That’s were we are reborn, made new creations, starting off the new life in Christ – that it’s no longer us living, but Christ in us. Our old sinful selfs is doomed to die, but Jesus Christ lives in us for ever and ever. There in Baptism the Holy Spirit was poured over us in richest measure, granting us the new cloths of Christ’s righteousness, covering up all our iniquities and healing all our diseases. Since then our daily life as Christians is nothing more than the continuous return and re-submersion into this divine flood of grace and saving font of life. The old Adam in us dies again and again, whereas we are raised up together with the true Lord and Deliverer Jesus Christ to live new lives in his righteousness and purity forever. Confession and Absolution is nothing else than living in the power of Holy Baptism. Therefore if we live in these, we live as Christians and can go our way joyfully and gratefully every day of our lives. Amen. My paradise at which my soul reclineth. here-in Thy grace forth shineth. Dost join us and sour children in our weakness. Thy heavenly riches all our loss retrieving. The power of hell and Satan’s bold deceiving. Be of good cheer and let no sorrow move thee! Joins thee to Him; how greatly God must love thee! The Lord prepared thee for all earthly sadness. Of greater glory, greater bliss or gladness. A crown be thine and honor in full measure. This entry was posted in Losung and Lehrtext and tagged Baptism, deliver, Holy Spirit, kindness, Love, mercy, Pray, Regeneration, Renewal, righteousness, save, Sin, washing, Work. Bookmark the permalink.